H Lewis-Foster, welcome to Romance Lives Forever. we're excited to interview your character, Nat Seddon from the book, Burning Ashes. 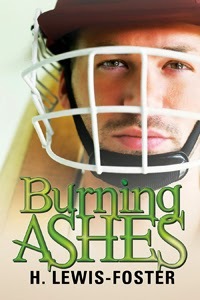 Tagline: Sporting rivalry turns to passion in a tale of true love and cricket. Blurb: Intelligent and confident, Australian cricketer Nat Seddon is one of the world's best bowlers. He's openly gay, but keeps his private life to himself, with everything under control. But on the last day of his team's Ashes tour of England, he meets Scott Alverley, England's promising new batsman. Nat tries not to be attracted to Scott, but he can't help finding the privileged young man handsome and endearing. Nat is tempted by a little end of tour fun, but finds himself playing agony uncle to a virgin. Instead of going home to bask on a beach, he spends a wet week in the north of England with Scott. Try as he might to resist, he can't help falling hopelessly in love. Nat and Scott are professional cricketers. Nat Seddon is 27 years old and plays for Australia, while Scott Alverley is 21 and plays for England. Hi there. My name's Nat Seddon. I'm a professional cricketer and, as I'm sure you can tell from my accent, I play for Australia. I'm a fast bowler, which means I have to keep myself pretty fit, and at six feet five, there's quite a lot of me to keep fit. I love cricket, but when I'm not playing or training, there's nothing I like more than curling up with a good book and a glass of wine. I know this'll sound really soppy, but Scott is the only man I've ever loved. Don't get me wrong, I wasn't a virgin when we met, but my sexual partners had always been friends and nothing more. But then I met Scott and everything – and I mean everything – changed. I don't mind admitting I was a bit uptight before I met Scott. I was always in control of my life and I didn't let anyone get too close. We spend so much time travelling in this job, I didn't want the heartbreak of a long-distance relationship, but the moment I met Scott, well…I tried so hard not to fall for him, but there wasn't a damn thing I could do about it. Scott couldn't be more different from me. He's got wavy blond hair and he's quite slender for a sportsman. And let's face it, he could be a catwalk model. I still get shivers just looking at him sometimes. He's the most beautiful man I've ever met–and the scattiest. He's so disorganized and he comes up with the daftest ideas. You'd never think he passed his exams with flying colours at that posh school he went to. But he's also the sweetest, kindest man I know. He'll probably drive me nuts when we finally get to live together, but I don't care. I love him and that's all there is to it. I think most people would say it's my dedication to my work. I dread to think how many hours I've spent in the gym and the practice nets over the years. I want to help my team win, whatever it takes, and I suppose I've brought that same dedication to my relationship with Scott. I hate it when we're apart just as much as he does. I guess I'm not capable of doing anything by halves. I grew up in Brisbane. My mum is a doctor and my dad's a barrister, so I had a pretty comfortable childhood. I went to a good school and I had some great friends, so I really can't complain. I got a bit of stick when I came out, but nothing I couldn't handle. Mum was amazing. She was so supportive, whereas Dad…let's just say I steer clear of my father if I can. He's never come to terms with what he calls my 'lifestyle choice'. The truth is he can't stand the thought of his only son with another man. We're civil to each other for Mum's sake, but that's as far as it goes. My best friend at school was Andy—he's a writer now and still a good mate. We had so much fun together and got into all sorts of scrapes. I told Andy I was gay when we were fifteen—he was the very first person I told. He shook my hand in this really grown up way and said, "That's all right, mate. Makes no difference to me." Then he got together with our other friends, Mark and Barry, and they swore to beat the crap out of anyone who gave me any trouble. I was big enough and strong enough to look after myself, but it was great to know they were all on my side. That would have to be Honeysuckle Cottage, Scott's parents' place in the Lake District. We went there the day after we met, and we really got to know each other there. It was where we made love for the first time too, and you never forget that. There's an open fire and cozy sofas, and shelves overflowing with books. The views of the countryside are breathtaking, and the housekeeper, Mrs B, keeps the fridge stocked with delicious food, which Scott is only too happy to cook. So I'd be glad to hide away with Scott in Honeysuckle Cottage any time. Good food, good books and the man I love. What more could a guy want? H Lewis-Foster has worked with books, in one form or another, since leaving university. As a keen reader of gay fiction, she decided to try writing herself, and is now the proud author of several short stories and a debut novel.